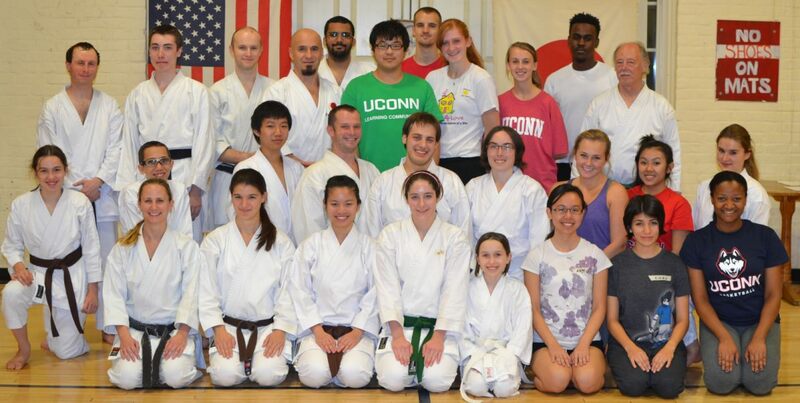 UConn Karate Club class, October, 2013. Front row: Aidan Boyce, Alex Jacobs, Liam Boyce, Sarah Boyce, Athena Tao, Ann Lau, Sapna Gupta, Caitlyn Boyce, Bob Jacobs. Second row: Emily Gauthier, Katelynn King, Brianna Boyce, Crystal Xue, Britny Fowler, Ashley Zane, Kim An Do, Abby Barrera, Amy Dann, Bill Gauthier. Standing: Darwin Jurado, Nick McIntosh, Nicole Depowski, Tony Carpanzano, Rob Terlikowski, Brian Boyce, Phil Minichino, Sokheang Chay, David Keovilay, Andrew Bakoledis, Sam Sommer, Mike Jacobs, Mark Rollins, Jason Hu, Brendan Costello, Julia Ohela. Front row: Melissa Jacobs, Katelynn King, Lynn Nguyen, Ashley Zane, Caitlyn Boyce, Ann Lau, Cindy Recinos, Emica Leveille. Second row: Sarah Boyce, Liam Boyce, Sam Wong, Ryan Jacobs, Phil Minichino, Britny Fowler, Gaby Levesque, Tina Dinh, Julia Ohela. Standing: Nick McIntosh, Aidan Boyce, Mike Jacobs, Rob Terlikowski, Gio Miranda, Xihao (Damon) Xu, Andrew Kindl, Sam Sommer, Shannon Hearn, Ramone Henry, Bill Gauthier.